One pic from archives ... My trip to American SouthWest last October. I was at Salton Sea, California, the last pit stop of the trip. Very interesting place starting from its creation, formations and birds. Beautiful bird huh? This post is linked to Wild Bird Wednesday and Nature Notes. Yes, lovely bird and great shot. Beautiful capture! One of my favorite birds. Pretty shot of the Heron! Enjoy your week! Beautiful photo. I hear that's a great place to bird...thanks to the efforts of Sonny Bono during his life, working to make it a wildlife refuge! Nice shot! Love the beautiful blue water, too. This is too much of coincidence - I was looking at some web pages about birding trip to Salton Sea this afternoon!! 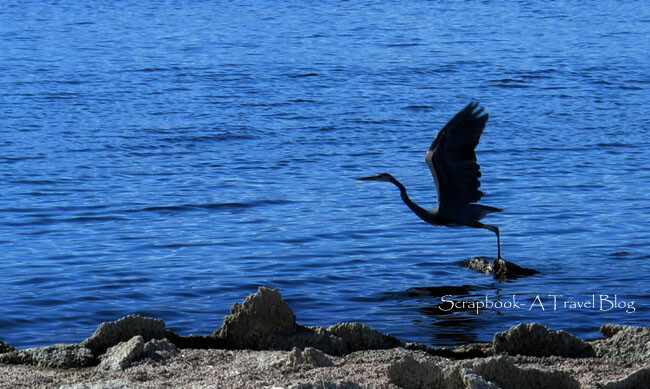 Wonderfully captured - the heron about to take off with its prey ! Beautiful and majestic bird indeed. Great shoot! nice capture,it's almost dark and time to fly home.